Welcome to the British Club Lviv. As strangers in a strange land we fell in love with the city of Lviv and it’s beauty. But there are parts of home we all missed. So the British Club Lviv was born, offering a range of accommodations to satisfy all fellow travellers and their reasons for coming. We endeavour to maintain the beauty of Lviv while adding the comforts of home. 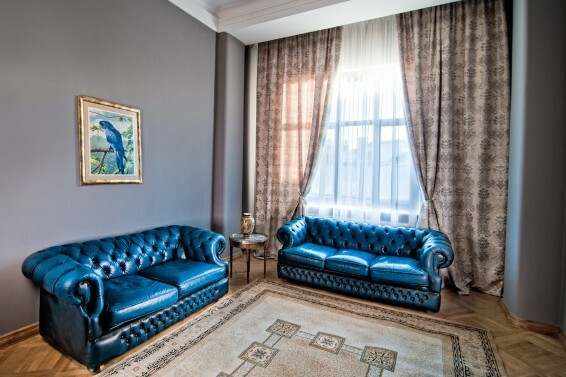 British Club Lviv’s newly refurbished appointed one and two bedroom luxury suites offer a taste of the old and the new with classical decor and amenities of the modern world. Entertainment systems in the living area and master bedrooms include a flat screen television, DVD and CD player. Each suite also contains a full kitchen for entertaining privately. Additionally, every suite is equipped with a secure high-speed wifi internet connection. Every suite is fully furnished with period furniture. Guests have access to a private video monitor system for visitor identification. Professional staff and technical services are available on-site. © Copyright 2012, British Club Lviv. All rights reserved.